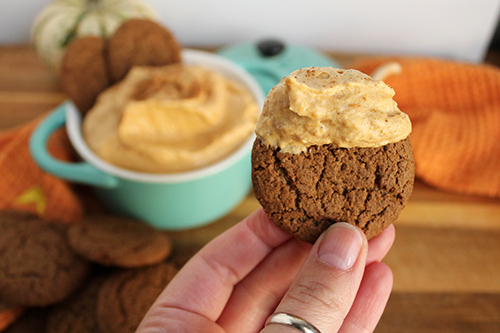 Let's talk about the easiest pumpkin crowd pleaser there is, pumpkin pie dip. I feel like this recipe has been around the block a few times, but then I take it to a party and people have never heard of it before. It's a super simple recipe that makes a pretty decent amount of fluffy dip and, though I wouldn't say it's healthy, using fat-free CoolWhip keeps the calories down. In a mixer, cream together cream cheese and sugar until combined. Add in spices and pumpkin and mix until just combined. Using a spatula, fold in entire container of CoolWhip. Cover and let the flavors meld together in the fridge for an hour. Serve chilled with ginger snaps or graham crackers. This dip can easily be made the day before and hang out in the fridge until go time. This recipe can be found all over the place, but this is my adaptation to it. I tend to like a spicier, more-pumpkin flavor so this recipe reflects that. Adjust spices to your particular liking, but keep in mind that the flavors really do come together in that hour in the fridge. Enjoy this dip with friends, but save a little for yourself to sneak as dessert.